Newly Revised & Updated for 2015. 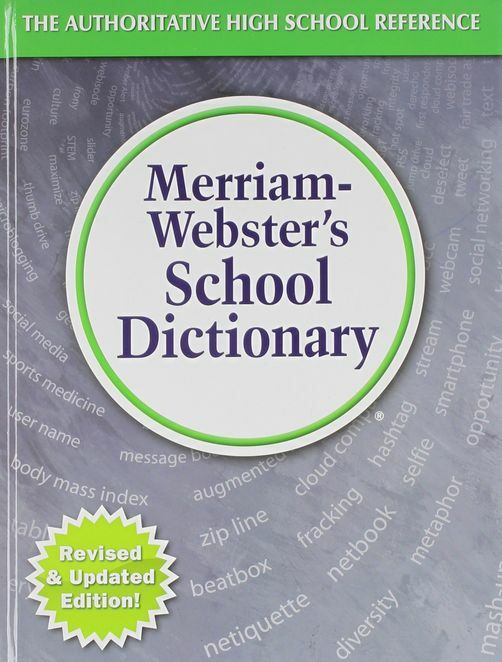 This hardcover dictionary is written especially for students grades 9-11, ages 14 & up. It features 100,000 definitions and 28,000 usage examples. Includes 150 newly added words and meanings across a variety of fields including technology, entertainment, health, science and society. It offers more than 500 synonym paragraphs, 200 word history paragraphs to help clarify meaning, and nearly 1,000 illustrations. A great study aid for students building vocabulary and preparing for college level reading. Special sections include biographical names, geographical names and signs and symbols. New words added include: hashtag, cloud computing, derecho, beatbox, mash-up, erythropoietin, carbon footprint, fracking, selfie, body mass index, unfriend,stream, tablet, netiquette, eurozone, augmented reality, tweet and zip line.